Admit it. The title is provocative. 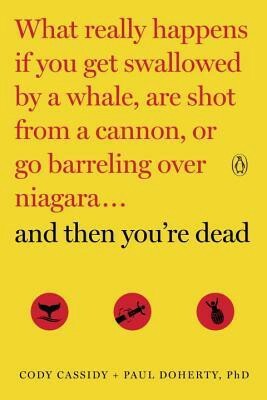 “And Then You’re Dead: What Really Happens” if something happens. It catches your attention. Well, I was caught too. I saw this book and was instantly curious to know what it was about. The book’s title is self-explanatory. The authors describe a variety of real and imaginary scenarios and explain what happens to the human body in those situations. There are about fifty such scenarios in the book ranging from what would happen if you ate as many cookies as the cookie monster to what happens during a shark attack. This could have been a gruesome and morbid book. But, thanks to the great writing, the topic of death is approached with a lot of humour, which makes it palatable. Also, the book is not really all that gory. Well, no more than what an average adult is exposed to nowadays on various media. In fact, compared to what is sometimes shown on news channels and R-rated shows like Game of Thrones or CSI, this is downright PG or PG-13 at best. We end up learning a lot of science (albeit dumbed down a little) across various fields and we have a blast doing it. The humour and easy reading make this book hard to put down. It is also very approachable and is fun for everyone. If there is one negative, it is that the human body can die in only so many ways. Which means that the impact on the human body becomes repetitive as the chapters progress. The good news is that it is still entertaining to read and there is a lot of learning throughout. I recommend this book as a light read.